In the snow-capped peaks overlooking Bariloche, Argentina, Refugio Frey is the only protection from the ravaging winds, drawing wanderers of all sorts to its doors. When a dog named Conga arrives and leads skier Santiago Guzman into the hills with her infectious energy, the windswept landscape becomes a backdrop for the pure joy of two mountain souls sharing a day in the wild. 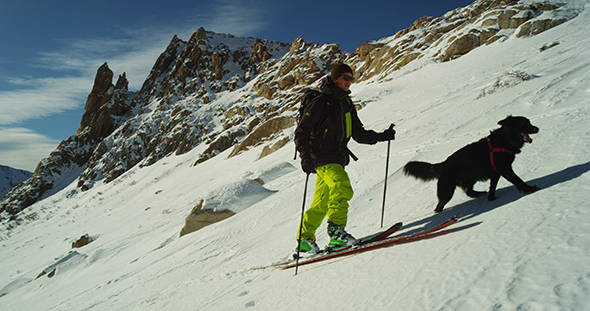 Watch the award-winning short film Sun Dog, as dog and man go skiing in a winter wonderland. See more dogs having fun in this dog video compilation. Piper the Aviation Bird Dog is always ready for duty. Alongside his handler Brian Edwards, the dynamic duo protects the planes from bird strikes.